A British Medical Journal report, published this month on a recent Sorbonne University, Paris, study, highlights the association between ultra-processed food consumption and potential Cancer incidence. It emphasises the potential cancer risks from over-consumption of such foods. The study concludes that a 10% increase in the proportion of ultra-processed foods in the diet is associated with a significant increase of over 10% of overall and breast cancer risk. Cancer represents a major worldwide burden, with 14.1 million new cases diagnosed in 2012. If this study is confirmed by studies elsewhere, the rapidly increasing consumption of packaged ultra-processed foods in our diet will add to the burden. Ultra-processed food products undergo multiple physical, biological and/or chemical processes to make them convenient to eat, appetising to taste, affordable to buy and supposedly safe to sell. These foods, however, often have a cancer causing potential from controversial additives and preservatives, higher total fat content, added sugar and salt, together with lower fibre and vitamin density. Contact of these foods with substances from the packaging may also contribute to risk. 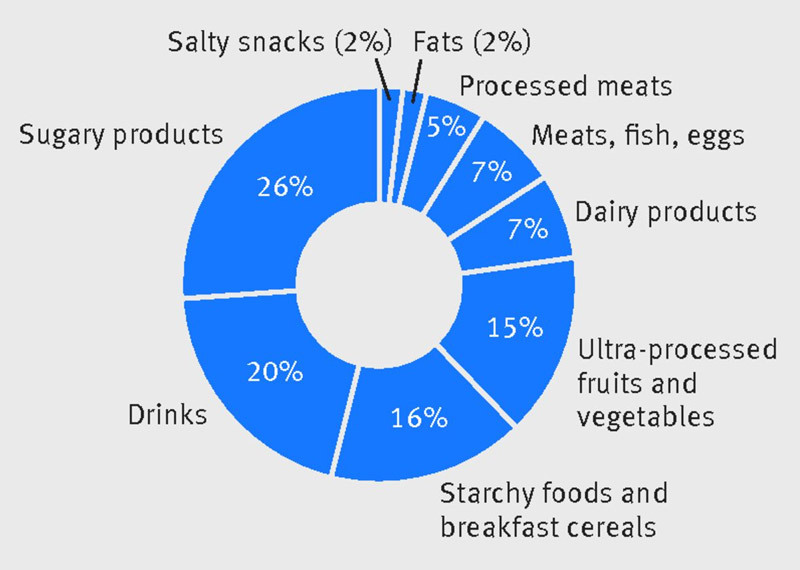 We now consume between 25% and 50% of total our daily energy intake in ultra-processed foods. The chart shows our average intake percentage. The Sorbonne University study is the first to evaluate the association between consumption of ultra-processed food products and cancer incidence, While it is conceded that further study is needed, it provides effective evidence at last of the overall cancer hazards of ultra-processed fats and sauces, sugary products and drinks. The study also showed that ultra-processed sugary products were specifically associated with increased breast cancer risk. According to the World Cancer Research Fund/American Institute for Cancer Research, about a third of the most common cancer growths could be avoided by changing lifestyle and dietary habits. Therefore, reaching a balanced and diversified diet, (along with avoidance of tobacco use and reduction in alcohol intake), should be considered one of the most important modifiable risk factors in the primary prevention of cancer. As Professor Ian Hampson has said before on this website, Cancer Prevention is more effective than Cancer Treatment! Consumption of ultra-processed foods and cancer risk: results from the NutriNet-Sante prospective cohort.